Magnificent park-like treed setting*Cute well maintained home w/2 FP*Kitchen w/tile flooring & tile counter tops open to greatroom inclusive of dining area & living room w/FP*Family room/den with new wood-plank flooring, bay window & freestandingwood stove*4 ceiling fans*Many outbuildings--2 shop/garages, one w/radiant heating & laundry rm, skylights & great storage &spacious room for projects & parking spaces*Great storage shed & a 3-sided barn/garage/shed*Freshly paved driveway*Pride ofownership! *Many possibilities exist with this immaculate property--inside and out*2 laundry rooms (2 washers & dryers included!) 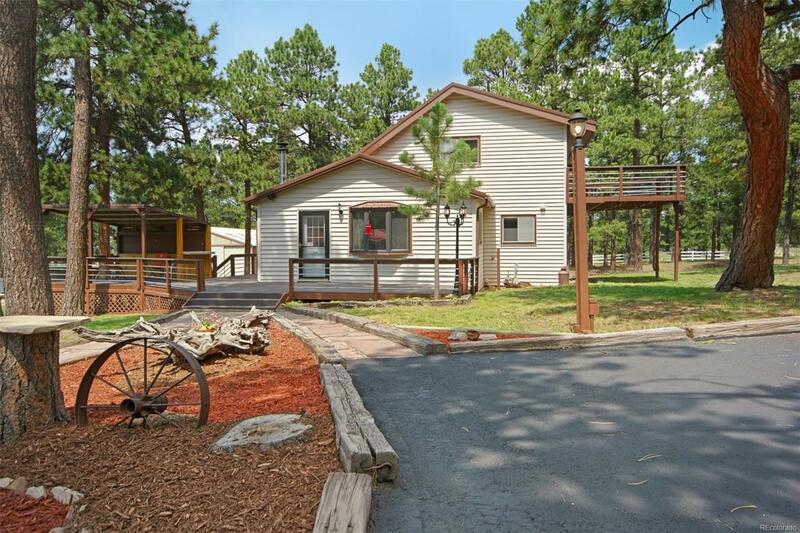 RV pad,multiple decks, large patio, flagstone walkway, storage buildings, minimum of 10 parking spaces*Trees are healthy and have beenmitigated*Fenced & cross-fenced w/vinyl and smooth wire*Metal roofing on house & all out buildings*Great location onwonderful dead-end street w/little traffic. east of HWY 83. close to intersection of Hodgen RD & Black Forest RD.